I am really surprised by seeing your massive support. You guys really made me happy to the extent, that I've never been before. So this release is for you guys, as a token of my gratitude. For new visitors - Please read this post for full details and instructions. My phone is dead right now, due to low power.So I couldn't upload screenshots, now. 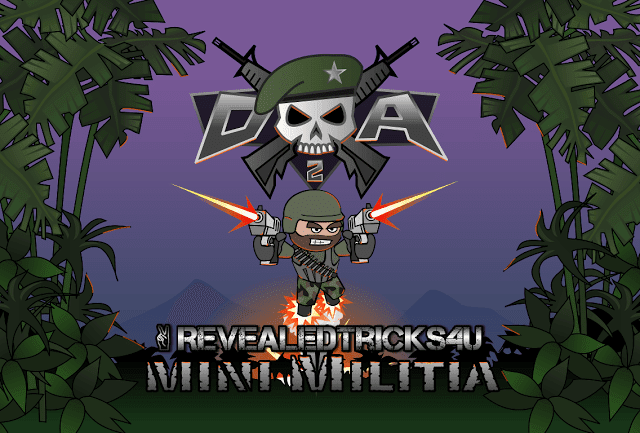 Mainly upgraded to v3.0 to support the latest version of Mini Militia v2.2.16. Dual Wield - Which allows you to take any weapons as a dual weapon in your character's hand like taking a Sniper with Fire spray or Double barrel with another Double barrel. (Read the app for full description). Pro pack - In some places, it fails to detect that Pro pack is purchased or not, that's fixed. And don't worry, some of the new features are still in development stage, only posted earlier due to vast amount of request for the updated app. The extra features will be added soon, as you know I always like to keep it as a secret :D.
MiniMilitiaMods-UPDATED-v3.0-RevealedTricks4U.com.apk - Click on Skip Ad after clicking this link, to get the download page. Pretty tired, can't talk more :), I will update the post soon, with some cool screenshots. Any doubts or problems feel free to use the comment box ;). Subscribe and wait more, you guys really gonna get surprised by seeing the future updates. found a bug. when you enable the Dual Wield. on Multiplayer. You can't kill the other players.... ? and after a while the game well crash. Its not a bug, I have already mentioned that in the application also in the post. When you enable Dual Wield in Quick play mode and If you take a weapon as Dual Wield, I mean like heavy weapons, then it will freeze the game, the problem happens due to the Online server's anti cheat program. But when you play in Local WiFi mode, it will be okay. Send me the rt4u logs through Contact me page, let me analyse the logs to find out the problem. Brother after restarting the phone all modifications that made are gone. It works like normal. please fix that issue also. I don't know how to take the rt4u logs from phone. Again and again I'm appreciating your your hard work keep doing.. It is the nature of Android. The patches are applied to the dynamically mounted library file, which will be replaced after a restart. I already thought of injecting the modification straight into the Apk, but it would take a long amount of time for each and every patches. Goto your internal memory, there you can see a folder named rt4u.Just zip it and send it to [email protected],. Only send If the app force closes or any problem with the app, ecause that logs won't contain the game binary logs. It might be a device specific problem. By reading the logs, it seems that your device is working on a Non ARM processor. This app and all patches only supports for the device with ARM processor. If you are not sure about what processor you've, please specify your device name and model number. unfortunately mini miltia has stopped working ???? what to do!! It seems in the version superior to v2.2.15 has some code which needs to be patched. Lemme find the code to be patched ASAP. There is a problem. Do I need to select all the patch and apply? Because when I select few and apply and play the game crashes.please help. Thank You. When I select only few mods and apply and play the game crashes please help. Thank you. Please make another Mini Militia without Mod but hack the store to God Mode. I mean change the health speed recharge to 100x and many more. I need it. I fell tired of waiting for update. I wish you can make it for me. I will appreciate that if you make for me. I'm sure more people want this. I have read your 3 comments on 3 different post and thanks for the appreciation. Its pretty complicated to make what you've asked, anyways let me try my level best. Will this work in no root device? No root app will be released around the start of the following month. so please tell me what to do????? I am not resourceful for that. I mean no apple devices in ma hand for coding one. dude mini militia 2.2.52 is out , plz make toggle mod for it . DA2v2.2.59 team has flew throughout the market with tons of latest features. Wont it b possible for you to create the possible toggle mod app for it? Make sure you've rooted your phone to make this work "
Hey bro I downloaded ur mod but its showing to update my app even when it's updated.